FirstGear has always offered a generous cut, but this jacket is running a bit large. They are running about one size larger than their stated size. We tried the jackets on our Fit Check mannequins (see a picture by taking the “View Larger Images” link above) and measured each size. The max chest and waist are consistently about two inches larger than they should be for any given size (about one size). Below are the “Sizing Guidelines” offered by FirstGear for 2012. I’ve added the “Our Chest” and “Our Waist” columns to let you know what we observed with a tape measure. The sleeve length estimates FirstGear offered seemed about right, so I didn’t give an alternate column for those. 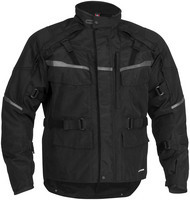 Tall sizes: FirstGear offers this jacket in talls. The body and sleeves of the jackets are 1 1/2 to 2 inches taller than the “standard” cut jackets. If you normally have to buy “talls” then these should work for you. Our overall assessment is that most people should buy one size smaller jacket than they normally wear in men’s clothing. 09-29-12: My friend Rick at webbikeworld.com emailed me a couple days ago and confirmed my sizing advice on this jacket. He bought a large (which is his usual size) before seeing my sizing advice and wrote to say he would have to order up a size Medium to complete his review. Thanks for confirming Rick!